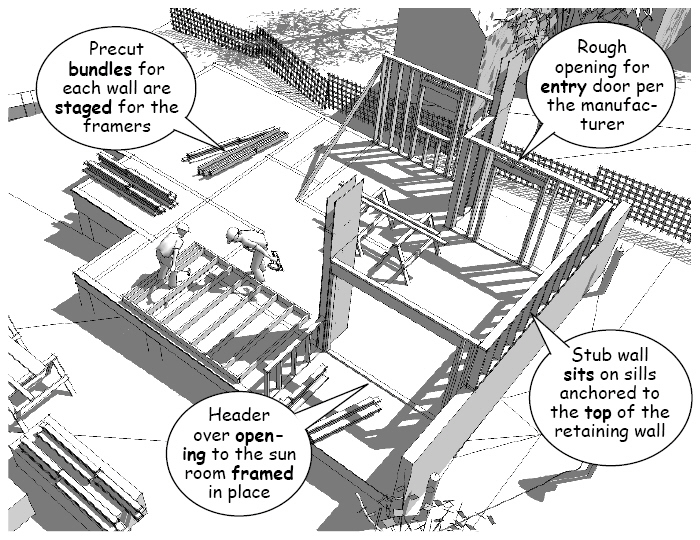 The construction method shown in this SketchUp process model is called “platform framing” because the interior is enclosed by wood studs, spaced to carry vertical and lateral loads as a lightweight space frame and the top plates of the walls are installed as a platform to carry the upper floor and roof loads. Engineers specify spacing and stud sizes to support the structural loads acting on the house and local indoor air quality requirements. The thickness of the outside wall is therefore a function of the depth of the stud, with the space between the studs used for loose, batt, or foam insulation. For safety, the walls are braced against wind load or accidental collapse as they are assembled and moved into place. The erection sequence and details at the corners and openings are determined in the field by the lead carpenter. Framing details around the doors and windows for the outside wall accommodate the stud sizes, wall thickness, and the loads carried by the shear panels and headers specified by the engineers. The top plates over the wall studs distribute upper floor and roof loads to the vertical members in the walls and the bottom plates and the floor joists below the subfloor. 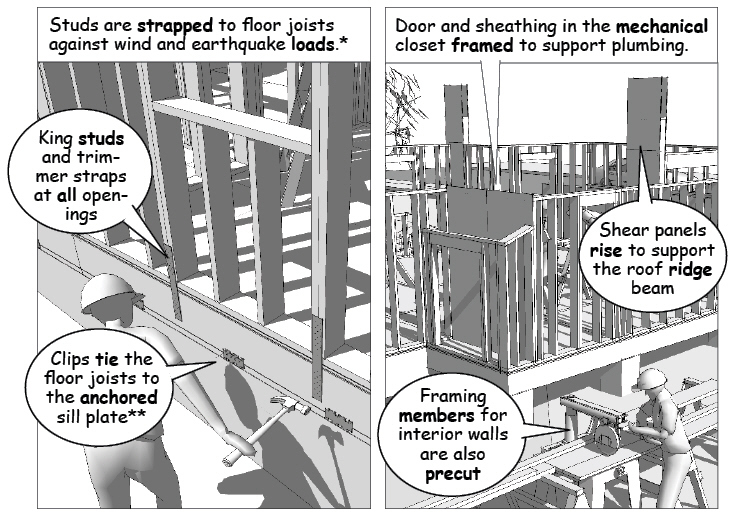 For detailed information about wood framing methods and load tables, see the American Wood Council publications and guides at http://www.awc.org. 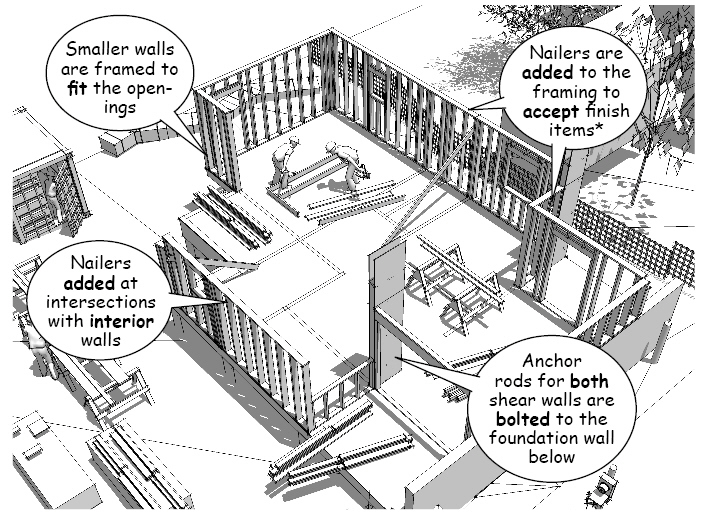 Nailers used to attach interior and exterior materials, cabinets, built-ins, shelving, and brackets are framed into the walls. The size and placement of these nailers depend on the weight and locations shown on the floor plans. Sheathing is nailed to the studs as the walls are being erected in areas that will be difficult to access once all the walls are in place. It would be a mistake to sheath all the outside walls before interlocking top plates and interior walls are installed because the frame would be inadvertently exposed to wind loads during construction. Safety is improved once all the perimeter walls are in place because they act as a guard rail around the work area. 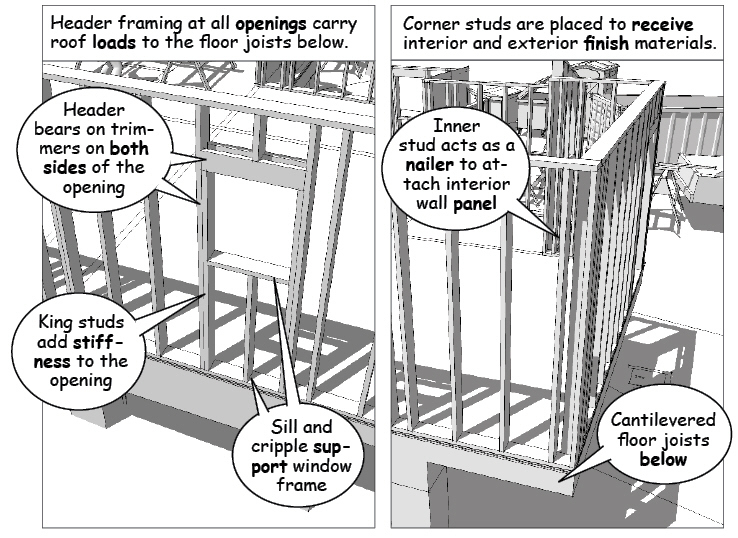 This is especially important in framing the upper floors of a larger building. Next, the outside walls are strapped to the floor framing and foundation. 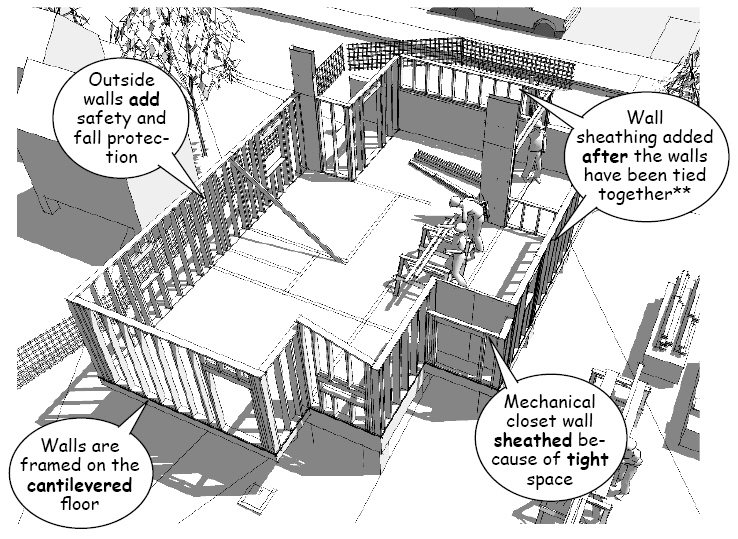 Note that details for the framing around the openings and the outside corners of the outer walls follow standard framing details that distribute structural shear and bearing loads to the floor and foundation. Standard structural connectors are used to tie the walls to the rim joists of the floor framing (See the Simpson Strongtie Catalog for wood construction). Spacing and location of these tie-down straps are specified by engineering calculations and the local building codes. Tie-downs and sheathing are important because wind and earthquake loads will generate positive and negative pressures causing dynamic uplift and rotational stresses on the completed frame.